Saw IV would possibly only make sense if you watched it a number of times, but good luck getting through it even once. Every little bit of dialogue, every event, and probably every sniffle and cough point to the big reveal at the end. Up until then, it’s all gory, murky incomprehensibility, in which the moralistic psycho-genius John Kramer (Tobin Bell), or Jigsaw, continues to pull people’s strings long after he’s dead. The movie attempts to give Jigsaw more of a backstory: he was married once, to a younger woman (Betsy Russell) who was carrying his child, and … Well, it ended badly, and then ol’ Jigsaw got hit with the cancer stick and smashed up his car, and after that triple whammy he undertook his life’s work (or his what’s-left-of-his-life’s work) teaching people the hard way to appreciate life. In Saw IV, the focus of his attention is on a cop (Lyriq Bent) so driven to Protect the Innocent that he neglects his wife. Ooh, a parallel! Jigsaw neglected his wife, too. 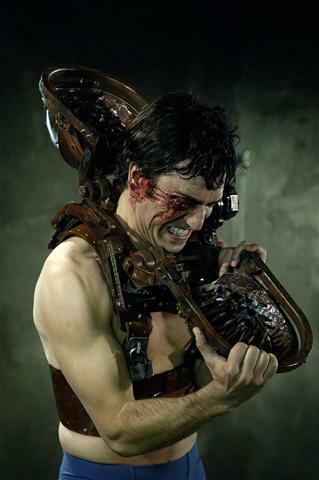 In Saw III, whose plot as it turns out unfolds concurrently with Saw IV, the message was to let go of vengeful rage; here it’s to let go of the need to save everyone. In Saw V, will Jigsaw go after the executives of Lions Gate and persuade them via Rube Goldberg torture devices to let go of their lucrative Saw Halloween franchise? Or will he go after horror fans who can’t get enough of these annual Mikado charnel-house ripoffs? Of course not. Instead, he goes after rapists and wife-beaters and junkies. For his other trick, he traps people into helping him out — either that, or he manipulates his victims into seeing his side of things. Once the Saw series is completely done, sometime in 2029 when Tobin Bell’s grandson is playing Jigsaw, someone will probably write a lengthy thesis on Jigsaw and his contradictory, hypocritical methods and philosophy. Jigsaw would rather not just kill you; he wants you to come out of the experience a nobler, stronger (if, sometimes, horribly disfigured) person, having learned a brutal lesson. In truth, Jigsaw is an interesting character with an interesting worldview and an interesting way of carrying out his will. It’s too bad the movies themselves aren’t worthy of him. For one thing, they’re too grim, and too self-satisfied in their grimness; there’s scarcely a spot of levity in any of the Saw films, and the people who must negotiate Jigsaw’s deathtraps are barely sketched in. The cop, for instance, is allowed no personality whatsoever beyond sweaty desperation, and in that respect he’s no different from anyone else who has danced Jigsaw’s macabre dance. For another, director Darren Lynn Bousman has his one trick and humps it to death: the helpless victim is given his/her ghastly choice, and there are approximately 407 whirling quick-cut shots of his/her screaming face from every possible angle. By now, the style and the premise are so rote and tedious that the Saw series has gone far past self-parody into dull convention, like every other horror series that should’ve died after the first two. Still, I’m aware that for young horror fans, these movies are what the Friday the 13th and Nightmare on Elm Street series were to my generation. You don’t go for complexity or wit or even good filmmaking; you go to see Jason killing horny teenagers, or Freddy killing horny teenagers in their dreams, or Jigsaw doing his diabolical-puppetmaster number. It could just be nostalgia, but it seems to me that soulless assembly-line horror somehow had more soul back then, y’know? 30 Days of Night is something of a John Carpenter portmanteau — it combines elements of his Assault on Precinct 13, The Thing, and Vampires — but it’s a better Carpenter movie than he himself has managed in recent years. It’s not a classic, but it’s good blood-spattered fun. The premise, taken from Steve Niles’ and Ben Templesmith’s murkily rendered comic book, is ingenious: A group of vampires single out an Alaskan town wherein the sun goes down for a month and stays down. No sun, no worries about deadly sunlight. What the vamps plan to do after they’ve bled the town dry is, I suppose, the sort of logical question that kills a really nifty-sounding idea. This is another endurance-test role for Josh Hartnett, who once rode out 40 Days and 40 Nights of celibacy and now, as the town’s sheriff Eben, must keep himself and a few survivors alive for a month of darkness. You got a timetable movie, Hartnett’s your guy. He doesn’t have much chops as a dramatic actor — like Jennifer Garner, he seems more comfortable in light romantic comedy — but he projects some decency and smarts, and that’s roughly all he needs. He’s joined by fellow lightweight Melissa George as Eben’s estranged wife and fellow law enforcer Stella, which gives Hartnett a chance to quote from Brando (“Stellaaaaa!”) if not act like him. Yeah, but 30 Days of Night would survive even with Paris Hilton playing both parts. The vampires are terrific — animalistic, speaking to each other in their strange, guttural language. (Their subtitled dialogue is just off-kilter enough to make them seem like aliens.) They warm up by sneaking around town before the prolonged sundown, torching all the cell phones, and so on. Many of the townspeople take off for the month, leaving only a few stragglers. Once the airplane departs for Anchorage, that’s it — the place is cut off by 80 miles of ice. Snowy isolation, of course, provided some of the nihilistic chills of Carpenter’s The Thing (not to mention The Shining) — no one will rescue you out here. “No God,” the vampire leader (an eerie Danny Huston, with a razory underbite) clarifies. Nature is red in tooth and claw. Much of the movie is a matter of moving the human protagonists here and there as they try to keep quiet. It doesn’t take long for 30 Days of Night to enter its ruthless Assault on Precinct 13 mode, in which there’s no time for anything but survival. If done tightly and well, though, such a movie is logistically entertaining — certainly more so than director David Slade’s previous feature, the sordid Hard Candy, also about the terrors of isolation. With a superior script to work with (by Niles, Stuart Beattie, and Hard Candy writer Brian Nelson), Slade works the bleak wasteland for all the spooky atmosphere and harsh beauty it’s worth, and he does some scary things with barely-glimpsed vampires hopping from roof to roof or emerging from shadow, always out of focus in the deep background. There’s even, I think, a nod to Night of the Living Dead with a little vampire girl feasting on a fresh corpse. 30 Days of Night compresses the comic book quite a bit, discarding some subplots and characters, but retains workable elements like a vampire wannabe (Ben Foster) who shambles into town in the movie’s stunning first scene. “That cold ain’t the weather,” says this stranger, “it’s death approachin’.” Dialogue like that makes me happy, and horror movies need more of it. David Slade knows how to make an audience squirm and gasp — a viewing of the lengthy sequence in Hard Candy when Ellen Page looms over the tied-down, pantsless Patrick Wilson with a scalpel confirms that — but in 30 Days of Night he uses that knowledge to announce himself as a bona fide horror director, not just a gimmicky indie director. Good. My beloved genre needs more filmmakers who know what they’re doing. George Clooney comes across as a guy who’s way ahead of you. In his usual screen persona, he knows what he knows, and sometimes he shares it and sometimes he doesn’t; he never says anything irrelevant. Now that Harrison Ford has drifted away from good roles for a few years, Clooney is the pre-eminent voice of reason and voice of authority in American movies. He keeps Michael Clayton going all by himself, but it’s heavy lifting. The movie, a first turn behind the camera for screenwriter Tony Gilroy (the Bourne films), is a drained and lugubrious legal almost-thriller with volumes of off-the-record, behind-closed-doors chatter. At first we’re flattered to get a peek behind the curtain, but as the movie goes on (and on) it seems like a lot of brooding over nothing fresh. 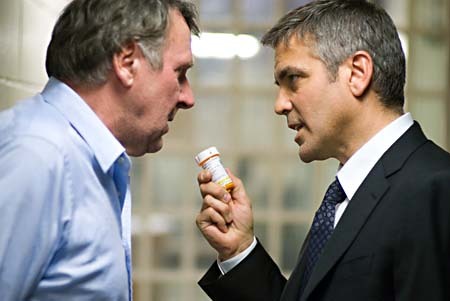 Clooney is the titular character, a “fixer” for a major New York law firm. Michael knows who to talk to, what favors to call in. He’s given a variety of Screenwriting 101 quirks: he has a gambling problem, he started a bar that went under, he’s divorced and has a smart young son who’s always trying to get him to read his favorite fantasy novels. Little of this coheres into a character; it just seems tossed in. Michael’s firm wants to wrap up a lengthy case wherein a major client, a chemical company, is defending itself against a lawsuit because a weedkiller it manufactured has killed hundreds of people. The firm’s top litigator, Arthur Edens (Tom Wilkinson), has stumbled across evidence that implicates the company, and his guilt has driven him off his meds and into insanity. Michael is charged with making sure Arthur doesn’t go public. Michael Clayton is about regaining humanity after a life of aiding the wealthy and corrupt, and it stays with Michael’s growing bitterness and desperation. The potential is there for a smart, adult drama that illuminates the soul of the compromised. But Tony Gilroy is a better writer than director. The movie swims around in despairing grays and blues, as if the celluloid itself had given up in sympathy with Michael. We’ve seen the plot motor before (A Civil Action, Erin Brockovich) — couldn’t Gilroy have come up with something else? The dialogue may crackle, but the characters are standard-issue, including an icy woman lawyer (Tilda Swinton) who has moments of private nervousness, rehearsing her lies in front of a mirror. Great: the only woman with a significant speaking part in what’s being touted as a complex drama is alternately a witch and a fumbly teenager. I appreciate that Gilroy attempts to give everyone flaws, but they feel too Hollywood-stamped. There are even two impersonal goons who loom in the shadows to carry out the chemical company’s dirty work. Michael Clayton has mood to burn — a sour, bluesy mood, the mood of weary men drowning their sorrows at the end of a rough day — but not much legitimate feeling. Clooney barely cracks a smile, so he doesn’t have access to the cockiness that often draws us to him. Michael is a hollow man in, ultimately, a hollow film. Complexity, to me, doesn’t involve placing the central character on the side of the angels and reassuring the audience that justice will be done. The movie is an odd duck — a depressive feel-good film, in which the characters we care about exchange their gray hats for white ones, and the black-hat characters keep theirs on. The final shot, which goes on long enough to call attention to itself, stares at Michael sitting in a taxi cab and, we presume, thinking about the life he wants out of — and is on his way out of. It’d work better if we hadn’t just seen a similar shot in Eastern Promises, wherein Viggo Mortensen sat silently and mulled over the violent life he couldn’t escape. Here, the focus on Clooney’s face reads as an easy way to give the impression that the movie is more thoughtful than it is. Michael Clayton is sleek and technically accomplished, but for all its complicated talk it feels disappointingly facile. Its bottom line is that people should feel bad for working for corrupt corporations whose neglect kills people. Who doesn’t know that? And who would rather see a complex drama about the actual people who died and lost loved ones because of corporate shenanigans, rather than about their legal saviors? I would.